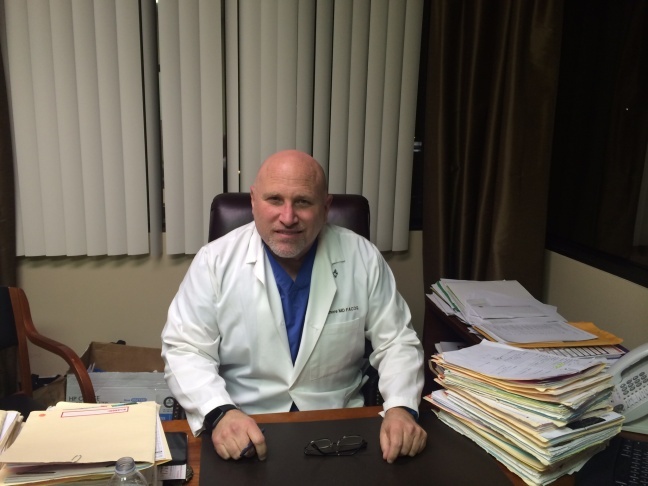 Dr. Brian Fenmore is an OB-GYN at Providence Tarzana Medical Center. On a recent morning, Dr. Brian Fenmore listens to the heartbeat of the baby growing inside a pregnant patient's belly at Providence Tarzana Medical Center. Everything looks and sounds normal, he says. But the woman is 42 years old and diabetic, so Fenmore explains that she's at higher risk of having a Cesarean birth. That spurs another discussion. "If you were to say to me, 'I'm done after this and I want my tubes tied,' this is a discussion we have to have," Fenmore tells his patient, who asks to remain anonymous. The American College of Obstetricians and Gynecologists says immediately following a C-section is the "ideal time" to perform the tubal ligation procedure, "because of technical ease and convenience for the woman and physician." But Fenmore explains that under Providence's religiously based ethical guidelines, he is prohibited from doing so. Fenmore says there is another option: If the woman ends up needing a C-section, she can deliver at the secular West Hills Hospital, 10 miles away. Fenmore maintains admitting privileges there so he can perform procedures he's not allowed to do at Providence. "I want you to have that option if you choose to have it, and I don't want any facility telling you that you don't get to have that option," he tells her. Providence Health Services turned the Tarzana facility into a Catholic nonprofit when it bought it in 2008. The hospital now requires its doctors to follow the Ethical and Religious Directives for Catholic Health Care Services, written by the U.S. Conference of Catholic Bishops. 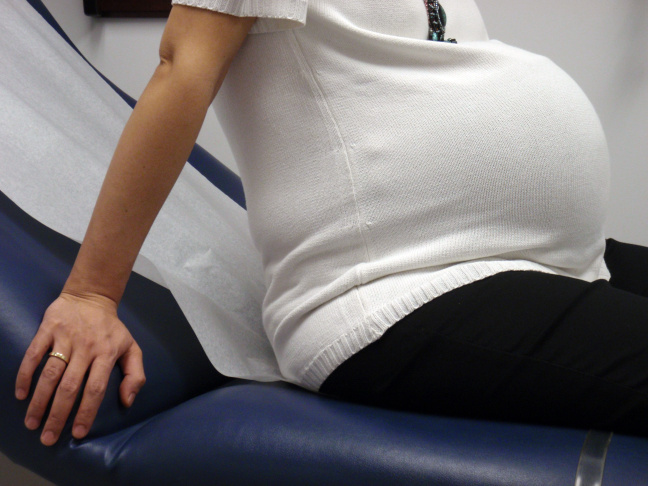 The Directives prohibit birth control, abortion and, in most cases, sterilization. The Directives are in the news because of a Northern California woman's lawsuit against Mercy Medical Center in Redding over its refusal to allow her doctor to perform a tubal ligation after a planned C-section. In its defense, the hospital says its policy is based on the Directives. Most of California's Catholic hospitals follow the guidelines, and that has some OB-GYNs, such as Fenmore, feeling caught in the middle as they try to balance their professional obligations to their employers with their personal desire to provide the full range of reproductive care to their patients. Fenmore has a teddy bear build and a warm demeanor with his patients. But in his office after the prenatal visit, he says he feels "handcuffed" by the hospital's religious rules. "To think that a person has to go to another hospital, sometimes not geographically desirable to them, because there's a religious bylaw that says they're not allowed to have a sterilization procedure is almost inconceivable," he says. Fenmore says he finds himself in this situation five to 10 times a year. Guided by "morals and values"
It's nearly impossible to say how often women are denied tubal ligations at Catholic hospitals. The California Department of Public Health says it has no record of any complaints about this. But one expert believes it could be happening a lot. Lori Freedman, a medical sociologist at UC San Francisco who researches this issue, says nearly one in ten births end in tubal ligations nationwide, adding, "that's a very large number of births where you would want access to that procedure." She says it could become a larger issue as Catholic health care systems expand. As part of her research, Freedman interviewed 31 OB-GYNs at Catholic hospitals across the country. She says Fenmore's concerns are common. "It was the first thing that came to most of their minds, the frustration over not being able to offer tubal ligations," she says. In response to a request for an interview, Providence provided a written statement in which the hospital says it provides high-quality health care that’s rooted in its mission, tradition, ethics and science. Lori Dangberg, vice president of the Alliance of Catholic Health Care, which lobbies on behalf of the state's Catholic hospitals, says doctors who work at these facilities have to commit in writing to abide by their bylaws. And, she adds, periodically they have to renew that commitment. "So that gives them the opportunity to understand what are the practices and decide if they want to continue to practice at the facility, if our morals and values align with how they want to practice," Dangberg says. Fenmore says he continues working at Providence because, aside from this one issue, it provides great care. And he's got his workaround, via his privileges at West Hills. Accepting a "framework of religious restrictions"
Not all of Fenmore's OB-GYN colleagues at Providence are critical of the hospital's religious restrictions. On a recent morning Dr. Taaly Silberstein meets a new patient – a college student who wants to start using birth control. They're meeting in Silberstein’s private office, a few blocks from Providence. Here, she can prescribe birth control. But at Providence, Silberstein respects the rules, including the one about tubal ligations. "If that was truly the only method of contraception, I would probably kick and scream – that would be really bad," she says. "But since there are good, alternative methods of contraception, to me, it's not a horrible thing. I understand." Part of that understanding stems from Silberstein's own faith: She's an Orthodox Jew. "I understand practicing your life in general within the framework of religious restrictions," she says. "Whether I agree or not, I respect that way of handling life." Silberstein points out that the hospital will approve a tubal ligation if it determines that another pregnancy could pose a serious health risk. Its ethics committee has approved the procedure for two of Silberstein's patients: One who had preeclampsia, another who was diabetic. "The only time I was denied is a woman who had serious postpartum depression and just didn't want to go through it again," she says. "So for them, I guess it wasn't a compelling enough reason." Meanwhile, the judge in the Redding lawsuit refused to force Mercy Medical Center to tie the woman's tubes after her C-section last month. But her suit is moving forward. Its outcome could affect whether doctors at California's Catholic hospitals will have to keep finding ways to work around restrictions on reproductive care.